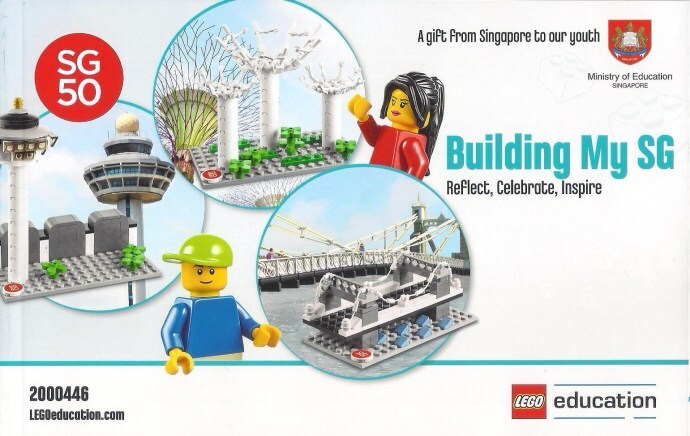 To commemorate Singapore's 50th year of independence, the country's Ministry of Education has commissioned a special LEGO set that appears to have been given to schoolchildren in the country. Called Building My SG- Reflect, Celebrate, Inspire, it provides parts to enable one of three local landmarks to be constructed: a control tower, a bridge and a tree sculpture modelled after those at Supertree Grove. Thanks to TSMERLION for the image. Thanks Huw for sharing. Awesome to see the iconic sights such as Changi Tower and Gardens by the Bay. Super exciting and what a way to celebrate our SG50. A Lego set for EVERY school children in the nation? I moving there. That's the kind of country I want to live in. I will be in Singapore in 10 days time for my monthly business trip. Anyone have any ideas where I can buy this (or where I can get a job in Singapore so I can escape my dozen years as an expat in Hong Kong)? Darn, they get those Shell promotional cars and this? That's it, I'm moving to Singapore. there are various independent lego stores in some of the smaller malls. I recall one at Tampines. They are generally expensive and sell parted out sets and figures. you might get lucky as this won't be too rare to Singaporeans or then again the kids will instantly build them and be proud of their personal Lego. Yeah, can any Singaporean AFOLs confirm if there are any alternate ways to get this set without having to (a) engage with scalpers or (b) kidnap schoolchildren? Getting bricks off kids is going to be difficult! Anyone who would want to sell me one let me know :D.
Wow! I wish we had this here in the U.S.! No timeline were given for the distribution (likely via the school), but I suspect should be anytime now since already saw a photo of the set taken at large. Just gotten more details from our SG AFOL forum, apparently first batch were already distributed out yesterday. There are a total of 600K sets produced, so looks to be more common than most of the Lego sets currently on sale. @rece, any chance of posting a parts list when your son gets his? He meant he had 2 kids in Primary school so will receive 2 sets. Hi buddy, may i know which SG AFOL forum is currently active? Thanks in advance! @KLS, it's a closed group, you need to send request to join. Search for "I'm a Singaporean Adult Fan of Lego (AFOL)" on facebook. Commonwealth Lego set. I assume that the local secretary of Education is an AFOL. Nice way to celebrate our country's independence!! Looking forward to this set! might have a set or two to let go hit me up!! "Will get 2 sets for my 2 Primary School Kids"
the sets will be made available to public. just wait and see. SINGAPORE: Students and teachers in the Republic will each be given a special set of "Building My SG" Lego bricks to commemorate Singapore's Golden Jubilee. The bricks can be used in class to construct three iconic Singapore Landmarks - Cavenagh Bridge, Changi Airport and Gardens by the Bay - each representing a distinctive aspect of Singapore. As a lead up to National Day, students will also use the set to collaborate an design the Singapore of their future together in the classroom . Those in primary schools, secondary schools, special education schools, Junior colleagues, ITE and Polytechnics will receive their sets progressively by National Day. Primary-level home-schoolers and full time Madrasah students will also be entitled to the SG50 gift. There are 600,000 sets in total, and the sets will also be made available for purchase after National Day by the distributor Duck learning.